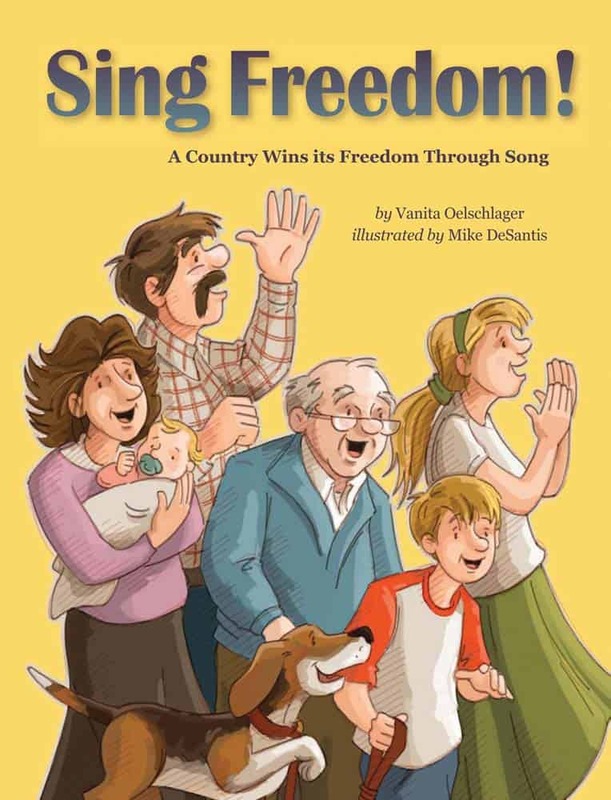 “Sing Freedom” is meant for children between the ages 7 to 10 years. The book has a total of 36 pages. Most of these pages contain 4 to 6 lines of text each. The language is kept simple and understandable. All the pages are accompanied by beautiful illustrations. Vanita Oelschlager’s “Sing Freedom” is based on a true story. A note at the start states that the detailed chronology of events has been removed so as to keep the text simple and the essence of the story intact. The book journals the freedom struggle of a small country called Estonia. Estonia is one of the Baltic nations which the Soviets ruled over after the World War 2 was over. This book informs us about how Estonians helped their country get independence using means of non-violence mainly singing. The illustrations are very beautiful and inspiring. They are also very realistic and help create the perfect effect which the text sets out to achieve – that of driving the message of non-violence. The book teaches the value of freedom and culture. It also spreads the message of non-violence. Overall, the book is quite entertaining and interesting, as it teaches us an important lesson of history by means of a cute little story. The information provided is also good and important. Estonia is one of the Baltic countries situated in North-eastern Europe. Estonia was once a part of USSR. I learned about the Baltic Human Chain which comprised of over 1 million people joining hands to form a human chain across the length of 3 countries – Estonia, Latvia and Lithuania in order to launch a silent protest against Soviet rule. The Estonian Song Festival is one of the world’s largest amateur choral events in the world and is proclaimed under UNESCO’s Masterpiece of the Oral and Intangible Heritage of Humanity. To state what you must have already gauged from the lines above, I recommend “Sing Freedom” to all children in the age bracket of 7 to 10 years and rate it four out of five stars.